If you are building serverless applications, then you want to get from zero to code in seconds. We've just shipped a brand new editor for Webtask which makes this desire a reality! The Webtask Editor is a rich online environment for creating, editing and testing your Webtasks. In addition, it allows you to manage secrets, configure github two-way sync, view realtime logs, and more. It makes serverless development a breeze and you never have to leave the browser or install anything to use it. And with our out-of-the-box support for over 1000+ Node modules, you can get a lot of work done. Let’s take a quick walkthrough of the experience. With the new editor, getting started can't get any easier. Just head to webtask.io/make, log in with your preferred credentials, and you'll be on your way. Webtask: this creates an empty webtask. Cron: this creates an empty scheduled webtask. Pick a template: start coding based on selecting from a library of templates. Import from GitHub: import your code from a Github repo to a webtask. Selecting "Webtask" will put you right into the editor where you can start authoring a new task. Cron tasks are great for executing a task on a schedule, such as checking a Twitter feed for mentions. When you create a new cron task, you will see two panes. The left pane is the scheduler where you specify the schedule for your task and the right pane is where you put the code for your task. For more info about cron, check this document. Templates let you choose from a selection of starter code that you can use for building your tasks. We've included templates for integrating Webtask with common services like Stripe, Slack, Sendgrid, Github, Twilio, Facebook, and many more. If you have existing Webtasks in a repo, you can import them directly into Webtask by pointing to the repo. Now let's take a look at some of the awesome editor features. 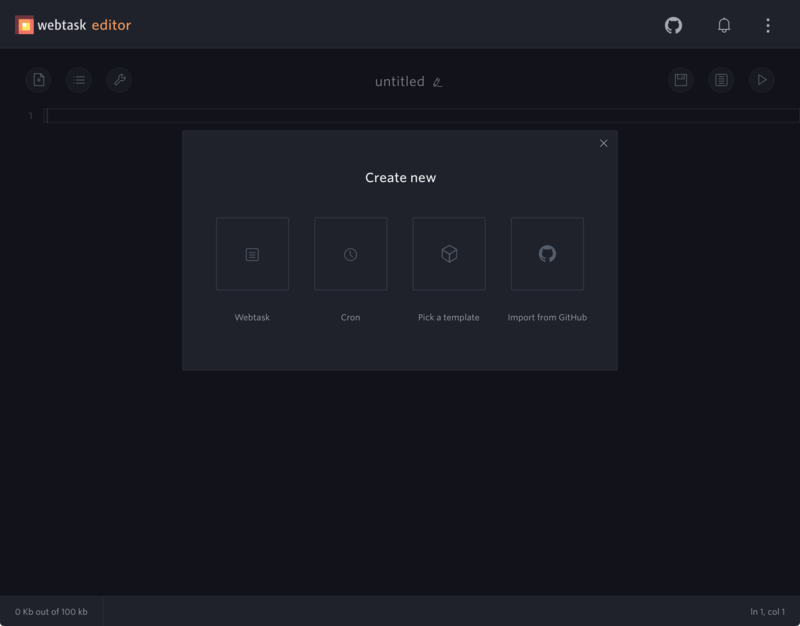 We've designed the new editor to streamline your development and allow you to iterate fast. To help with testing, the editor comes with an intergrated runner. In the runner you can set different HTTP methods, parameters, headers, etc. To help with debugging, we've added a realtime logs viewer that lets you view you tasks console output while it is executing. If your tasks are talking to other authenticated services, you don't want to store credentials in the code. You can define new secure secrets right in the editor, which are then accessible from the code via the context object. To take your experience up a notch, we've baked in Github integration support. This allows you to sync your webtask with a file in a Github repo. You can enable this to work bi-directionally, such that commits and pull requests to the repo result in the task automatically being deployed and any changes in the editor result in commits to the repo. You can also bind multiple tasks to different branches of the same repo, thus having dev, test, and prod versions of your tasks. It's super powerful! Press CMD + P or click on the list or on the "Webtasks" icon and you'll see a list of all your tasks. From the list, you can switch to a different task, open a task in a different window, or even delete tasks. You can type into the search bar to filter the list of displayed tasks. The new editor has tons of shortcuts for common actions within the editor as well as additional features like beautifying your code. You can see the list of shortcuts by clicking on the Shortcuts icon in the upper right corner. If you like using our CLI, we've got you covered. You can go right from the shell to the editor with the edit command, i.e. wt edit mytask. The new Webtask Editor is an amazing tool for serverless development. It will let you instantly go from idea => code => running. Not only do you get a rich browser-based authoring experience, but you get a tool to secure, test, and debug your code. Go get started playing with the Webtask editor now: webtask.io/make. Also check out our documentation at webtask.io/docs/editor.